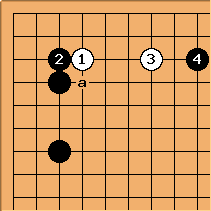 There really ought to be a good reason for playing this way, rather than enclosing the corner conventionally. But this enclosure is more common than one might think: certainly in conjunction with the Chinese fuseki or mini-chinese, but also when the left side has special importance. 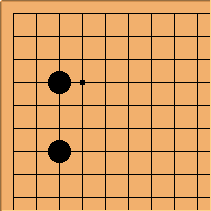 If White plays here next, there are a number of ideas. was played by Fujisawa Hosai. This is a special technique: but now White can push at a with quite a good feeling. White probably doesn't get away with playing here; Black almost certainly chooses this enclosure in cases where is too heavy. 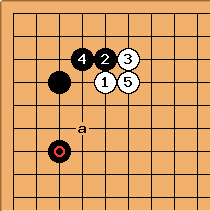 Of course Black could also pincer; but the question is where ends up (and White at a looks like a useful kikashi). The other normal corner approaches are seen.